In Go Home? The Politics of Immigration Controversies, Hannah Jones et al investigate the effects of UK immigration policy on local communities, drawing on interviews, focus groups, ethnographic observations and surveys. The book offers a powerful demonstration of the everyday impact of immigration controls and narratives, writes Sarah Burton, and unserscores the necessity of forging solidarities of resistance. Go Home? The Politics of Immigration Controversies. Hannah Jones, Yasmin Gunaratnam, Gargi Bhattacharyya, William Davies, Sukhwant Dhaliwal, Kirsten Forkert, Emma Jackson and Roiyah Saltus. Manchester University Press. 2017. In July 2013, the Home Office launched Operation Vaken (11), the public face of which was two ‘Go Home’ vans bearing the message: ‘In the U.K. illegally? GO HOME OR FACE ARREST. Text HOME to 78070 for free advice and help with travel documents. We can help you return home voluntarily without fear of arrest or detention.’ Go Home? The Politics of Immigration Controversies explores perceptions and narratives of immigration control in light of this particular public performance, and the imbrication of racist tropes and language within it. The authors note the ‘politically volatile context’ in which they write (10) – and this can hardly be overstated. The book arrives hard on the heels of increased migrant-oriented racist and xenophobic attacks since the June 2016 UK referendum vote to leave the European Union, as well as the killing of MP Jo Cox, an advocate for migrant rights, by a man shouting slogans drawn from far-right fascist group, Britain First. Given that in the 2015 UK General Election, the putatively left-wing Labour Party brought out a mug emblazoned with the legend ‘Controls on Immigration’, the perspectives, analysis and identifications of new forms of everyday resistance brought to bear in this book are nothing short of vital reading across political and social positions. Based on the ethos of ‘live sociology’ (Back and Puwar 2012), and drawing on a combination of focus groups, individual interviews with local activists and policymakers, an Ipsos MORI survey, participation in online debates and the team’s ethnographic reflections, Go Home? investigates the effects of UK immigration policy on local communities, and who can belong within them. The text is underpinned by returns to concepts of belonging, home and humanity – and in many ways, Go Home? extends conversations begun in Stories of Cosmopolitan Belonging, which shares authors (Hannah Jones and Emma Jackson) with this study. The analysis of home and belonging is brought about especially through the focus on the everyday bordering practices that the Go Home vans represented and enacted. The vans also employed a close-up image of a border guard’s uniform and handcuffs (11), the juxtaposition of this imagery aligning the Home Office publicity with a securitisation narrative seen to be played out in ‘the fortification of state borders [and] more aggressive forms of border surveillance and policing’ (5; see also Didier Bigo 2002). In Chapter Two, this focus on tensions between bordering and belonging emerges through conceptualising the Go Home vans as a type of political performance or street theatre. Using the work of Shirin Rai (2015), the research team highlight the instability of such performances – particularly in relation to the ambiguity of the ‘interpretive power of audiences’ (42), which reminds us that ‘what the powerful say and do may not determine how all actors understand what is happening in a public space’ (43). 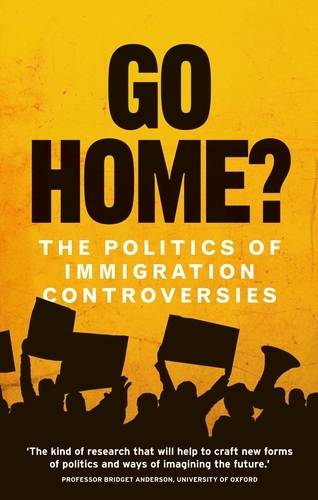 Throughout the chapter, the authors use the words of participants to show how the particular audience of the Go Home vans was open to interpretation, and that through this, so is the ultimate message – here, the book complicates straightforward assumptions of the power of a dominant discourse. What comes through most strongly from participants is an overwhelming scepticism: indeed, the authors note that there was ‘a strong sense in the [Dagenham focus group] that the theatricality of such performances was designed to distract public attention from government weakness in the face of immigration’ (54). The chapter parallels this with recognition of the performance of bordering taking place, noting how this occurs through ‘reiterating the border at the border and through new signage in public locations’ as well as how the ‘circulation of immigration enforcement teams, branded vans, and public raids all extend the space of political performance to the street’ (43). Coupled with the prevalence of narratives of scepticism across accounts of migrant/refugee/pro-immigration participants and those who are anti-immigration/immigrant, the analysis in this chapter sharply demonstrates how ‘the very act of reasserting such sovereign authority also served to underline the fragility and precariousness of state power’ (51). It is compelling, then, to read this in light of the poetry of Warsan Shire (above, and quoted in Go Home? ), and her potent evocations of a precarious home and the arrogance of apathy. Go Home? is also a book sparked by anger (141), and one which poses necessary questions regarding the role of rage and disbelief in shaping research trajectories. One of the key strengths of the text is the ‘Living Research’ sections that appear after every chapter. In these the authors pose reflexive methodological questions and expound on the decisions taken during research, including aspects they continue to feel uncomfortable with or upbraided by (65, 115-17). These sections are enlightening regarding the context of the book and its findings, as well as being an extremely helpful resource in teaching methodology and research design and reflecting on one’s own practice. Significantly, though, they also extend the discussion of emotions and affect into the practice and products of social science research. Picking up on the scholarship of Audre Lorde (1984), the authors foreground the ‘power of anger as a motivating force’ in doing social research that produces change as much as it does data (143-44). Owing to this, Go Home? is a sensitive and thoughtful contribution to discussions of public sociology (Burawoy 2005), as well as feeding into ongoing questions regarding the place of the university in public life and the role of higher education. Chapter Five discusses the notion of un/deserving migrants – the ‘openly moral judgements’ (120) that declare someone ‘good’ or ‘bad’ and therefore deserving or undeserving of care, support and compassion. This chapter does important work in examining the ‘values beyond value’ (Skeggs 2014), and the possibilities which exist for valuing human existence outside of exchange-value, economics or the push to ‘contribute’. The most affecting testimony here comes from participants who narrated examples of ‘everyday acts of kindness that [served] to resist or subvert dehumanisation’ (129). What shines through are the solidarities possible through the recognition and valuing of love, which help ‘counter the tendency to pit groups of people against each other’ (137). The authors refract this through the work of Imogen Tyler (2013) on how certain subjects are positioned as abject and ‘revolting’ – people ‘identified as outsiders, so that others can be considered insiders’ (123). In this respect, the work of Go Home? and its underlying focus on what it means to be human and to be treated with care, dignity and respect are desperately needed. The failures of social and public policy, and the ensuing horrific effects of the rhetoric dehumanising and demonising migrants and refugees discussed in Go Home?, come into sharp focus through the more recent tragedy of Grenfell Tower. Since the building burned down on 14 June 2017, heart-stopping and anger-inducing accounts have emerged of a deadly intersection between the effects of austerity, the abjection of the poor and the ways this is visited on the daily lives of working-class people through social and public policy decisions. Go Home? is a text strongly oriented to a sense of home – the authors dedicate it to ‘those still seeking a home’. Crucially, Nesrine Malik has highlighted that many of the victims of Grenfell were migrants and refugees, and that the lack of care given to the safety of their living conditions emphasises the lack of respect and concern afforded them as human beings. In Grenfell we see how the issues attested to in Go Home? play out in everyday realities: a coupling of the dehumanisation of migrants and refugees feeds into a lack of care from both state and ordinary actors. It is a stark reminder that even upon being housed in the UK, ‘home’ for many migrants and refugees continues to be – as Warsan Shire writes – ‘the mouth of a shark’ (25). In its focus on home, belonging and humanity, Go Home? acutely demonstrates the searing effects of immigration policy and controls quietly working themselves into everyday life, and that solidarities of resistance are more necessary than ever. Sarah Burton is an ethnographer with research expertise in postcolonial sociology, affect, value and the history of intellectual thought. Her work examines the relationship between the craft of writing and how knowledge claims come to be understood as ‘legitimate’. Sarah completed her Ph.D. in Sociology at Goldsmiths. UK immigration detention: What sort of reform, and when?